As the NBA trade deadline passes, the Jazz are keeping their team together. Mike Conley remains a Memphis Grizzly. (Trent Nelson | The Salt Lake Tribune) On the bench down thirty points, Utah Jazz guard Ricky Rubio (3), Utah Jazz forward Jae Crowder (99), Utah Jazz guard Dante Exum (11), Utah Jazz center Rudy Gobert (27), and Utah Jazz forward Derrick Favors (15). 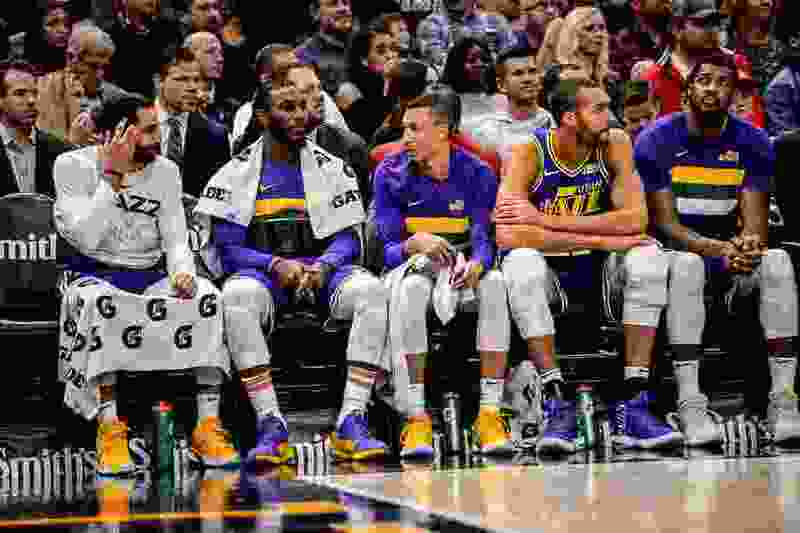 Utah Jazz v Indiana Pacers, NBA basketball at Vivint SmartHome Arena in Salt Lake City on Monday Nov. 26, 2018. But at this year’s NBA trade deadline, Jazz general manager Dennis Lindsey found his fellow GM dance partners were more interested in the foxtrot, the waltz, the samba, or maybe even not dancing at all. In the end, the Jazz weren’t able to complete any deal before Thursday’s 1 p.m. Mountain Time deadline. Take Lindsey’s interest in Memphis’ Mike Conley, the 31-year-old point guard under contract for the next two-and-a-half seasons who’s currently averaging over 20 points and six assists per game. The Grizzlies confidently announced their arrival to the trade deadline scene at the end of January through the mouth of ESPN’s Adrian Wojnarowski, and several suitors were interested. The Jazz were perhaps the most serious: they had a real need for an upgrade at point guard, and held the expiring contracts to ensure the Grizzlies wouldn’t pay for their trade of Conley beyond next season. Lindsey offered point guard Ricky Rubio, plus some combination of expiring contracts — though the Jazz were hesitant to include Derrick Favors in that package — and a first round pick in exchange for Conley. Memphis, though, had come to the floor asking for more. Conley was their best player and was signed for a long time, they reasoned. Rubio and the expiring contracts didn’t do anything for their franchise, stuck in a rut this season, in the long run. With a rough consensus around the league that the 2019 draft won’t be terribly deep, the thought of a pick in the 20s there wasn’t attractive to Memphis, either. So the Grizzlies asked for Dante Exum, and Lindsey said no. They asked for another first round draft pick, and Lindsey said no — though he tried to add in a second rounder to get closer to the asking price. He knew his trade offer was likely to be the best one on the table. In the end, the Grizzlies decided that there was no reason to take the medium-level return now, with Conley under contract for years to come. The two teams may yet agree to a deal in the offseason, but the Grizzlies hope other teams will want to come to the table. In Washington, Wizards GM Ernie Grunfeld came to the dance floor with his hair on fire, finally admitting his team needed to sell off assets after learning John Wall would miss at least the next 12 months due to a ruptured Achilles. Otto Porter was the man the Jazz were interested in, but Washington’s interests appeared to be in young players, not picks — the Wizards have never been a team that values first-round picks as a franchise-building tool. In the end, the Bulls’ offer of Jabari Parker and Bobby Portis provided the Wizards with two players scoring over 14 points per game at the age of 23, something that the Jazz couldn’t match. Grayson Allen and Exum don’t hold the same value, for example. Pelicans GM Dell Demps may have been the most wanted man in the room after superstar Anthony Davis publicly asked out of New Orleans, earning him a fine in the process. But Davis’ request opened up the doors for his other players to be traded, like big man Nikola Mirotic. Demps received a haul of four second round picks for Mirotic, including two of Washington’s — likely to be high-quality. To make the salaries match on the deal, he also acquired Jason Smith and Stanley Johnson from the Milwaukee Bucks. Hoping Jrue Holiday would be similarly available, the Jazz were highly interested in acquiring the Pelicans’ point guard. But after a Davis departure, Holiday figures to be the face of the franchise, and so the Pelicans were totally uninterested in trading their second-best player. And as the New York Times’ Marc Stein reported, the Knicks called the Jazz when trying to find a home for Kristaps Porzingis. They called Lindsey to offer him to Utah, knowing Utah liked the Latvian in the NBA Draft and tried to trade up for him then. But, in return, they asked for star guard Donovan Mitchell. For the Jazz, that was a non-starter. After all of that, and assuredly many more discussions and non-deals the media never heard about, the result was the Jazz never found a way to improve the team overall. Sure, they could have sacrificed multiple picks for Conley or Mirotic, for example, but would that really put them over the hump in the long run? Lindsey and the Jazz know they need more talent, but that talent wouldn’t necessarily come on deadline day. That Utah stood pat will please Joe Ingles. The news certainly made Rubio happy, after he was perhaps the name most mentioned in the rumors of the past week. It was a busy day elsewhere around the NBA. • While the Grizzlies didn’t find what they liked for Conley, they made multiple other moves. First, they traded the expiring Marc Gasol to Toronto for Jonas Valanciunas, former Ute Delon Wright, former Jazzman C.J. Miles, and a second round pick. Meanwhile, they sent JaMychal Green and Garrett Temple to the Clippers for guard Avery Bradley, creating a massive trade exception they can use in the next 365 days. They also sent former Jazz point guard Shelvin Mack back to Atlanta, in exchange for Tyler Dorsey. • After acquiring Mike Muscala from Philadelphia on Wednesday morning, the Los Angeles Clippers forwarded him across the Staples Center hallway to the L.A. Lakers for Michael Beasley and Ivica Zubac. The deal gives the Lakers another big man who can shoot the 3-ball, though perhaps not the big man they wanted after discussions with New Orleans about Anthony Davis broke down. • Orlando acquired former No. 1 pick Markelle Fultz from Philadelphia in exchange for versatile wing Jonathon Simmons, a first round pick they acquired from Oklahoma City (originally included in the Jerami Grant deal), and a second round pick. Fultz gives Orlando a long-shot chance at a star, while the Sixers get a small return on their investment and move on from a distrustful player-team relationship. • Houston made several moves to duck under the luxury tax. They sent James Ennis to Philadelphia for the rights to swap second round picks in 2021, and sent Nik Stauskas and Wade Baldwin — acquired yesterday from Cleveland — to Indiana along with another second round pick. The Wizards sent Markieff Morris and a second-round pick to the Pelicans for Wesley Johnson, a move which also allows Washington to get under the tax line. • In minor trades, Portland sent Caleb Swanigan — who spent much of his childhood in Salt Lake City — to Sacramento for Skal Labissiere. The Celtics sent Jabari Bird to Atlanta, in a money-saving move. Bird will be waived. Toronto traded backup center Greg Monroe to Brooklyn along with a second-round pick in exchange for cash. In the end, the Eastern Conference looks poised to host an all-out battle royale at the top, with the Bucks, Sixers, and Raptors all adding major pieces to their starting lineups. The Celtics, of course, remain involved in the top-4 race. Meanwhile, the West doesn’t look to be largely changed. Save for the teams just out of the playoff race like L.A. and New Orleans, who dumped talent, the conference looks just as tough as it did at the beginning of the season.